Stir-fry of tofu, potatoes and carrots • Quick & Tasty - Get Cooking! 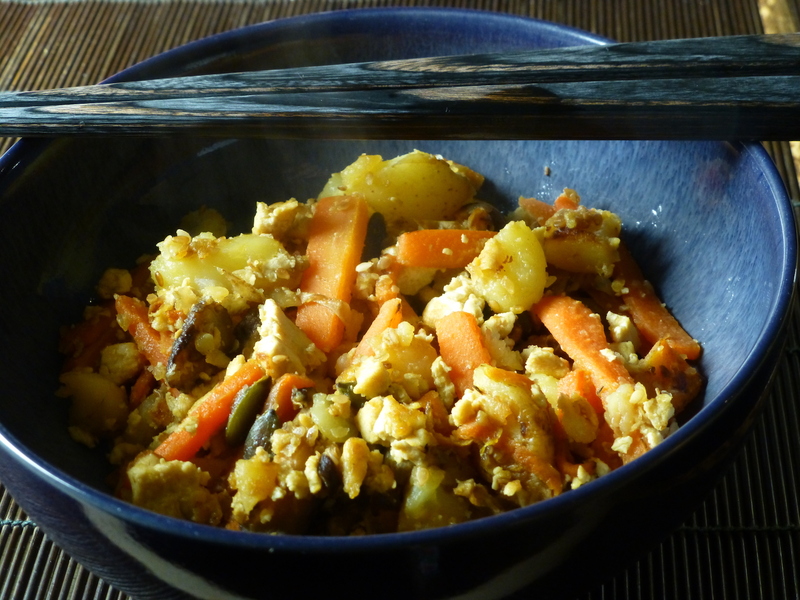 This is a variation on scrambled tofu iridoufu (炒り豆腐). I combined it with potatoes and stir-fried carrots into a complete one-pan meal. It takes a bit longer because the carrots need to be cut quite finely. 5 dried shiitake mushrooms, soaked in hot water for at least an hour. You will need 4 tablespoons of the soaking liquid as well. Cook the potatoes in the microwave at full power (900W) for 10 minutes, stir halfway through. Cut the carrots into julienne strips and cook them in the microwave at full power (900W) for 2 to 3 minutes. Heat the oil and fry the seeds and ginger for a minute. Meanwhile, mix 4 tablespoons of the shiitake soaking liquid with the miso.